Successfully Added 2 DIN Opel Car DVD Player - GPS, 7 Inch Touch Screen, CAN-BUS Decoder, 3G&4G Dongle Support, Wi-Fi, Android 8.0.1 OS to your Shopping Cart. This 2 DIN car DVD player with Android operating system is designed specifically for Opel Vehicles and works with most models such as the Astra, Antara, Vectra, Corsa, Zafira, Meriva, Vivaro, Insignia, Signum, and Tigra. With its 7 inch touch screen display this Android car stereo brings 1024x600 high definition so you can enjoy a crystal clear picture and great with great detail. This2 DIN car stereo combines all your entertainment needs with state of the art GPS navigation and included CAN BUS support for effortless controls direct from your steering wheel. Fitting directly into the dashboard of your Opel car this powerful DVD player will upgrade you're in car entertainment with awesome music audio and visual entertainment while getting you efficiently from A to B. The SIRF III GPS module provides exceptional accuracy and with Android Map support you'll be guided to your destination. This car DVD player has support for 3G dongles as well as Wi-Fi so you can use it to surf the web, check in with Facebook or download news updates. You can even expand your music library by downloading online content. With Bluetooth connectivity you can pair your phone to the car stereo and drive safely while talking calls hands free. OK Google will even let you compose text message by dictating them to the Google assistant so you won't be distracted or suffer any penalties for using your phone through this car stereo. Keep all your passengers entertained with the awesome audio and video properties of this in car entertainment system that supports disc from all regions and has extra video output so you can hook it up to rear seat monitors and keep the kids distracted on those long journeys. 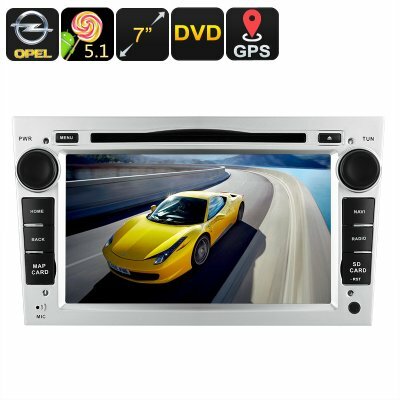 This Opel CAr DVD Player comes with 12 months warranty, brought to you by the leader in electronic devices as well as wholesale 2 DIN and Android Car Stereos..
Works with models: Opel Combo Vauxhall /Astra H G J 2004-2011/Antara 2005-2011 Vectra C B 2004-2011/Corsa C D 2004-2011/Zafira B 2005-2011/Meriva 2004-2011/Vivaro 2006-2011/insignia 2004-2011 Combo 2004-2011/Signum 2003-2011/ Tigra TwinTop 2004-2011 (The car manufacturing year is just for reference). Works with below models: Opel 2004-2011, Specific support models are as follows: Opel Combo Vauxhall/Astra H G J 2004-2011/Antara 2005-2011 Vectra C B 2004-2011/Corsa C D 2004-2011/Zafira B 2005-2011/Meriva 2004-2011/Vivaro 2006-2011/insignia 2004-2011 Combo 2004-2011/Signum 2003-2011/ Tigra TwinTop 2004-2011(The car manufacturing year is just for reference ).